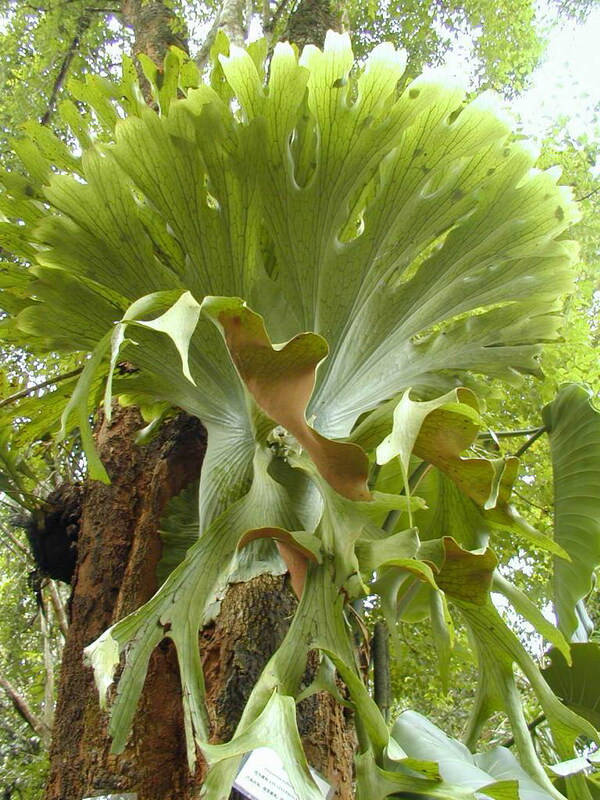 Staghorn ferns are members of the Polypodiaceae plant family, and belong to the genus Platycerium. Eighteen species are presently recognized along with many varieties and hybrids. Staghorns are tropical plants native to the Philippines, Southeast Asia, Indonesia, Australia, Madagascar, Africa and America. In their native habitat they thrive as epiphytes, generally found growing on tree trunks, branches, or rocks. Tropical rains provide moisture and wash nutrients into the root area. Staghorn ferns are valued for their highly variable and unusual growth habits. The plant produces two distinctly different fronds (i.e., leaves), (a) basal and (b) foliar. Basal fronds, often called “sterile fronds,'' are rounded thickened fronds which grow in overlapping layers and clasp onto a growing surface. The upper parts of basal fronds may be lobed or divided and stand erect. This upright form efficiently collects water, fallen leaves, and plant debris. These products eventually break down, releasing nutrients necessary for growth. Foliar fronds, also called “fertile fronds,'' are either erect or pendant and may be divided into lobed or strap-shaped divisions. Foliar fronds produce brownish reproductive structures (called sporangia) on the underside of their fronds.These sporangia hold spores which, when germinated, form new plants. Both basal and foliar fronds are covered to varying degrees, with small stellate (star-shaped) hairs giving them a silvery cast. These hairs provide some protection from insect pests and conserve moisture.